Here’s The Origami Lab, or, “Why a physicist dropped everything for paper folding.” Beautiful. Leyla Torres documented variations on a ‘pinwheel’ origami fold on a project called Wonderfold Squares. Peter Callesen made 3D paper sculptures out of pieces of paper. They are cut and scored, and therefore are not considered to be pure origami, but still! 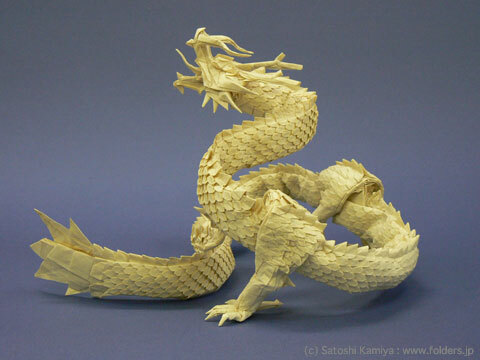 Speaking of papercuts, let’s see if you can make any of these Chinese masterpieces. But enough extravagant display of unattainable handiwork. The guy whom I got the dragon link from, Robert Lang, actually gives you the templates to make one of those. 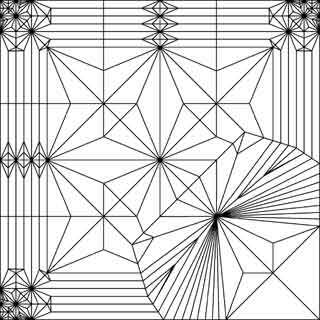 Okay, the templates doesn’t make it look any easier, even after looking at another site that is clearly labelled “A Beginner’s Guide to Crease Patterns“, but they’re still a sight to see. And this is one sick dragon. The guy also made paper figures of characters from, get this, Final Fantasy. His crease patterns are strangely hypnotic, maybe because they’re drawn in black and white. The good people at Coudal Partners, whose links made up a lot of Link En Fuego, might like this one. And, yes, in case you were wondering, there are also Yahoo Group and blog dedicated to the study and the interpretation of crease pattern, respectively. With the “occasional ethanol induced post.” Read that? Ethanol. Induced. Post. Awesome. That, if you ask me, is worthy of Link En Fuego’s Interlude coverage. My big thanks to the Proceedings of the Athanasius Kircher Society for some of the links.